With the advent of smart technology, urban planning methodology is undergoing a transformative period, and may lead to paradigm shifts in planning. It is expected that the availability and use of big data would help make better informed planning decisions. The application of urban science techniques should also enhance efficiency and effectiveness in planning scenario generation, testing of potential planning outcomes, and selection of the best option. It will also bring public participation to new levels and dimensions. With all these changes and developments, an important question to ask is whether amidst all the advantages that smart technology promises, the planning process and outcomes indeed take better care of all those who are affected, and create more sustainable, equitable and accessible places to live and work. 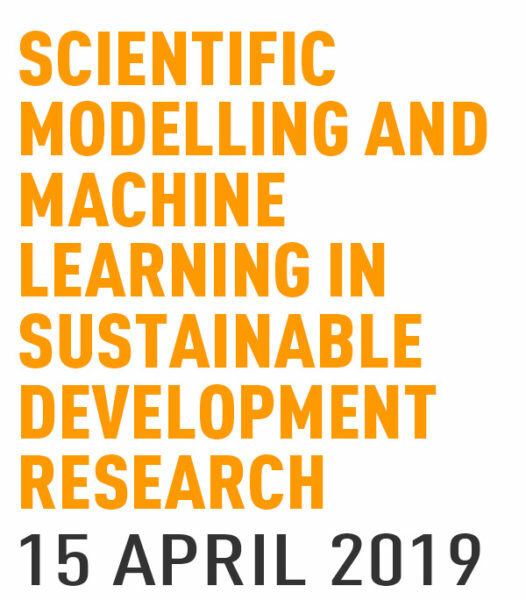 This symposium provides a platform for planning practitioners and researchers to ponder and discuss these issues. From Cybernetics to Smart Cities in 60 Years: What’s Been Learned? Alfred Weber’s urban analytics of the first decade of the twentieth century stretched to a pulley and weights system, with which he demonstrated ideas of optimal industrial location theory. Over the years, the weights became mathematical expressions and optimisation methods turned from real gravity to analogical gravity and from deterministic mathematical computational algorithms like simplex and systems of differential equations, to emergent computational algorithms such as artificial neural networks. Along the way, various narratives have bound together data, techniques and purpose. Roughly half way between then and now, following the massive intellectual input into control systems during WW2, came the application of the science of cybernetics to cities. Now, 110 years since Weber published his first pulley experiments, the narrative of urban cybernetics is back: the science of controlling cities. Compared to the first time around, the promises are more achievable. But what are they exactly? What exactly is the ‘smart city’ narrative, once the allusions and illusions and the political and academic gloss have been pared back? What can wired-up cities deliver of real benefit to society? Is the smart city revolution just about the short-term efficient operational management of urban flows such as traffic, energy, pedestrians, shoppers and emergency vehicles? Is there also a smart-city dividend for longer term management of urban stocks (housing, open land, workplaces, CBDs etc) – i.e. urban planning? Reflecting on these questions, Professor Webster will make a distinction between smart city sensing technology, smart urban data algorithms (what is the AI dividend for cities? ), smart planning and smart urban management objectives. Prof. Chris Webster has a background in urban planning, computer science, economics and economic geography and is a leading urban theorist and spatial economic modeller. 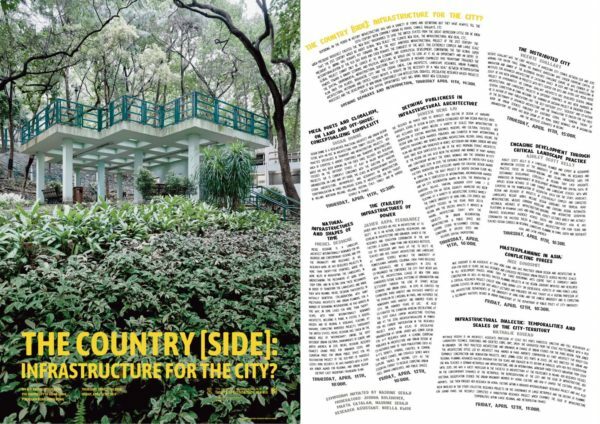 He has published over 150 scholarly papers on the idea of spontaneous urban order and received over 20M USD of grants for research and teaching and learning projects. 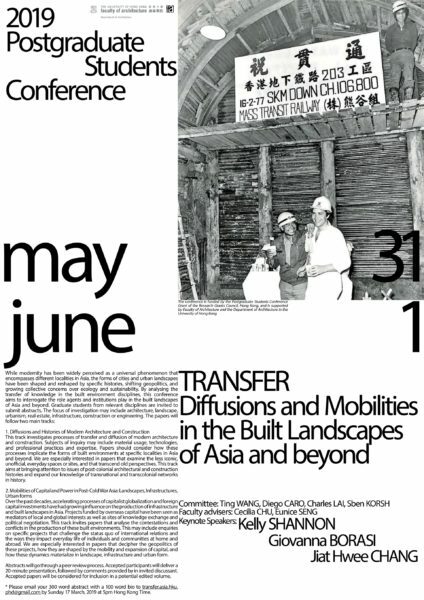 He was co-editor of the urban modelling journal Environment and Planning B for ten years. 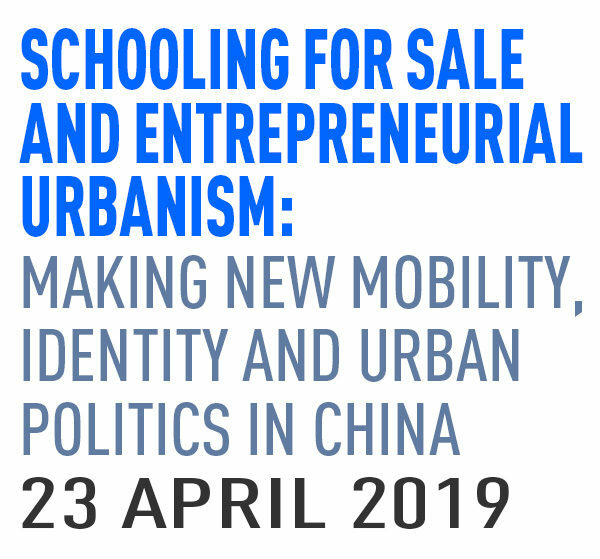 His books include Webster and Lai (2003) Property Rights, Planning and Markets, Cheltenham, Edward Elgar; Glasze, Webster and Frantz, (2006) Private Cities, London, Routledge; Wu, Webster, He and Liu, (2010) Urban Poverty in China, Cheltenham: Edward Elgar; and Wu and Webster (Editors) Marginalisation in Urban China. London: Palgrave McMillan; and Sarkar, Webster and Gallacher (2014) Healthy Cities: Public Health Through Urban Planning. Cheltenham: Edward Elgar. Nowadays Construction 2.0 together with Industry 4.0 have become main focuses in building a sustainable smart future. 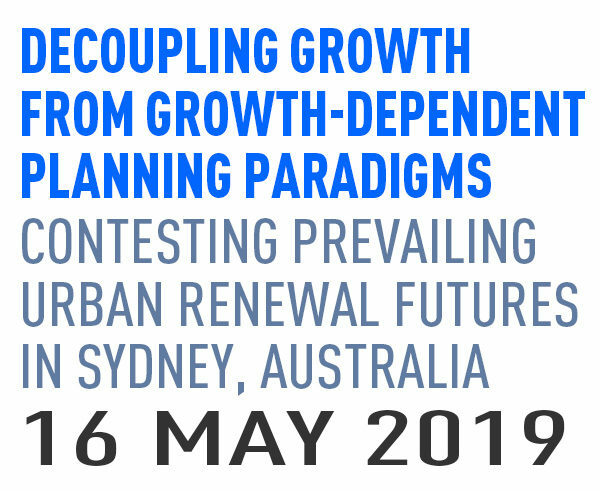 Rosana Wong will show how her Group integrated micro spatial and macro level of geographical synthesis through full lifecycle management from sustainable urban planning, smart design, holistic construction management to asset and facility management. 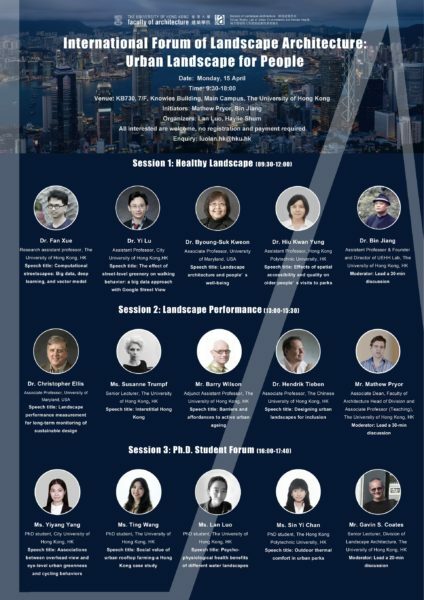 Rosana will further share about the Group’s latest Modular Integrated Construction (MiC) System, Hong Kong’s only and first approved concrete MiC, as well as the BIM-enabled Integrated Blockchain MiC Management Platform which build towards enhanced sustainability and precision construction. Rosana Wong is a visionary entrepreneur and has 2 decades of experience in different business entitles globally. She began her career in Hong Kong since 2003 in Yau Lee Holdings Limited and was then appointed as Executive Director in 2008 to oversee the Group’s corporate business development, formulate strategic directions, lead/invest and implement R&D projects and advanced technologies, manage construction projects as well advocate corporate social responsibility. Under her leadership, Yau Lee Holdings Limited has grown to be a forward thinking, green integrated corporation.Rosana is driven by her passion in technology, innovation, science and urban spatial planning. 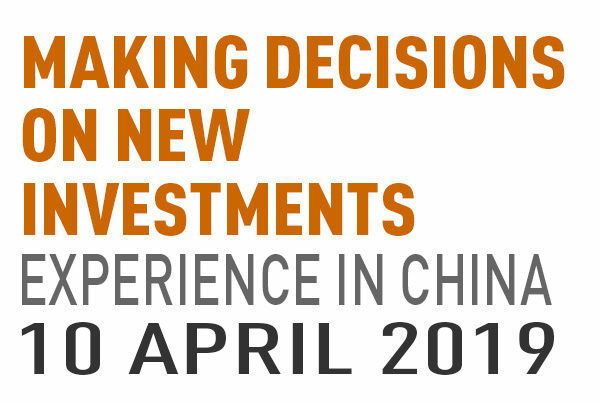 In 2016, she has established Ophylla Ventures and group of multidisciplinary startups in four pillars – environment, infrastructure, care and transformation – in the context of smart city, to create better choices towards a smarter and more sustainable ecosystem through exponential research and development in this dynamic community. Cities throughout the world have reaped the benefit of the evolving technology to become smarter. 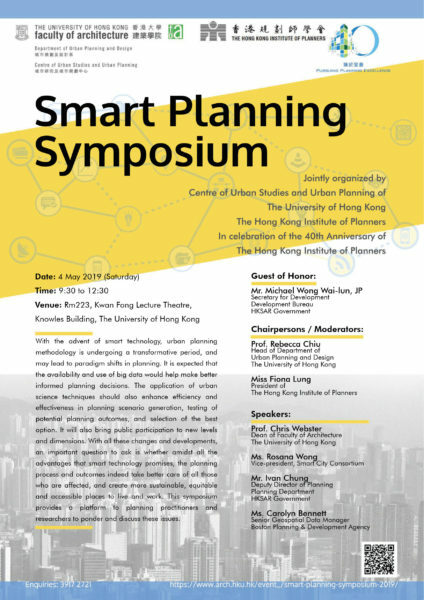 Application of various smart initiatives leveraging the latest Information Communication Technologies can help enhance planning work and gear up town planners for challenges ahead.The presentation will explain how “the 3D Planning and Design System” (the System), facilities and enhances planning work. As a one-stop portal, the System comprises a host of planning and development-related information, embedded with 2D/3D visualization and analytical functions, fostering smart planning. This System signifies a major step forward in applying digital technology to facilitate smart urban planning and has won the Merit Award under HKIP 2018 Award. 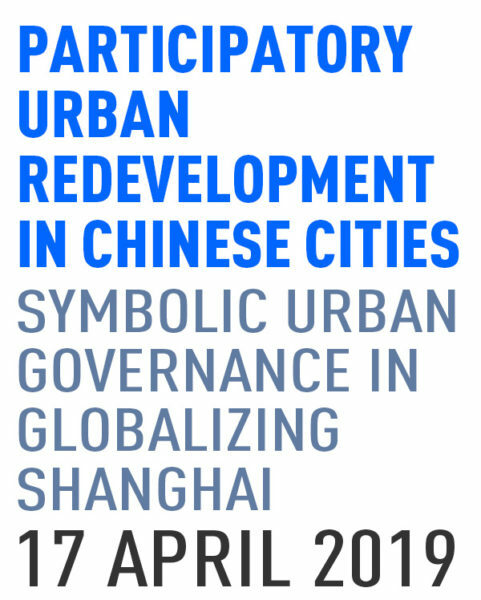 Also, opportunity will be taken to will share the initial findings of the recent consultancy study on the “Common Spatial Data Infrastructure – Built Environment Application Platform” to demonstrate the feasibility of the built-environment applications to foster smart governance and smart city development. Mr CHUNG Man Kit, Ivan has a Bachelor of Arts degree from HKU and a Master of Science (Urban Planning) degree from HKU. 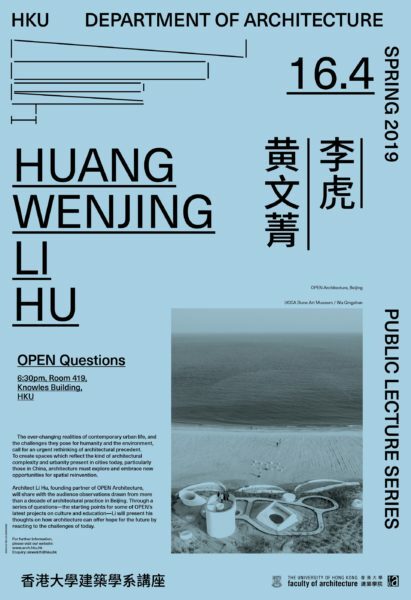 He is a Member of the Hong Kong Institute of Planners and a Registered Professional Planner.He joined the Hong Kong Government in the 1980s and has been involved in new towns, district planning, strategic planning, major development projects, and planning and engineering studies. 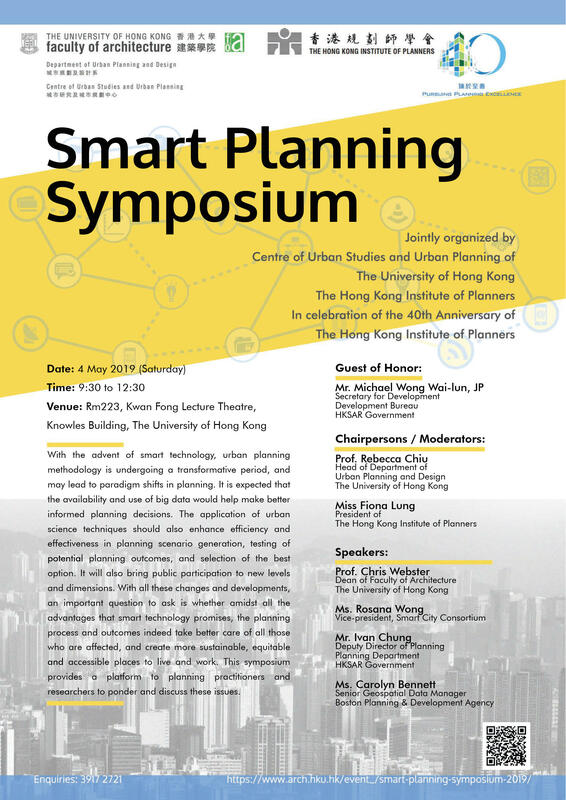 He is Deputy Director of Planning/Territorial of the Planning Department overseeing Hong Kong 2030+ (updating of the territorial development strategy), cross-boundary planning, Lantau Tomorrow Vision, New Development Areas in Hung Shui Kiu, Yuen Long South and New Territories North. He also supervises the central technical services for the Department. The Boston Planning & Development Agency (BPDA) uses a 3D GIS Basemap for visualization by providing a ‘real-world’ context as the basis for exploring, planning, and analyzing Boston’s urban context – including communication to support initiatives such as area planning studies, development proposals in the pipeline, and in-house urban design studies. The BPDA worked with Esri to develop 3D Planning Tools: 3D Smart Model Basemap, Urban Design Analysis Tools – Shadow Tools, Visibility Assessment Tools, Zoning and Development Capacity Tools.A 3D view of the city allows Boston to explore and communicate the impacts of new development plans with all stakeholders. Boston’s 3D city model provides a detailed environment for the city, developers, and citizens to evaluate proposed development understand the impact of new buildings.By 2030, the population of Boston is expected to reach 760,000 residents — a 20 percent increase from the current population. To help city planners plan for resident growth, the BPDA is using a suite of tools to that show the impacts of rezoning and redevelopment projects.BPDA worked with Esri to develop ArcGIS Urban. BPDA is using Esri’s ArcGIS Urban to create 3D models of the city that incorporate Boston’s zoning code and key features such as the amount of shade a tall building throws.We wanted to develop workflows that used metrics and a standardized process and procedure to evaluate projects moving forward. Carolyn Bennett is the Geospatial Data Program Manager for the Boston Planning & Development Agency (BPDA) in Boston, MA. Prior to joining BPDA, Ms. Bennett has worked professionally with local and regional planning agencies in Arizona, Vermont, and the National Park Service in Washington DC. Ms. Bennett completed a Masters in Urban and Regional Planning from University of Pittsburgh, Graduate School of Public and International Affairs (GSPIA) in 1991.Ms. Bennett’s GIS focus has been in urban planning, zoning, 3D modeling, historic preservation and environmental conservation. Ms. Bennett strives to use new GIS tools to publish and create web maps for enlightened decision making and in demonstrating transparency in government. As the Geospatial Program Manager, Ms. Bennett provides support and maintenance of GIS data systems to enable more efficient operations, analysis and planning and ensure quality assurance of products and services.The Geospatial Data Program has been at the forefront in developing and creating a Citywide 3D model, managing projects involved in evaluating Shadow impacts, Zoning and Capacity Analysis tools, Visibility Assessment and Community Engagement. If you have any queries, please call 3917 2721.